Chiropractic Clinics Lexington: What Are People Saying About Our Columbia and Lexington Chiropractic Offices? In the articles we’ve written, we’re usually telling you about some service that our chiropractic clinic offers, whether it’s traditional chiropractic treatments, spinal decompression therapy, cold-laser therapy, or any of a number of health treatments that we offer at both our Lexington and Columbia chiropractic offices. Every so often we like to do something a little different, such as letting our clients do the talking. We’re quite proud of the number score we get from the various review sites like Google, Facebook, and Top Rated Local, but it’s also very important to read the reviews to find out exactly what our clients are trying to tell us. Let’s take a look at some specific Facebook reviews, followed by our responses. So glad you wrote a review for us, Hart! While we welcome competition from other chiropractors in Lexington or Columbia, we’re very happy that you noticed what set us apart. We’re certainly happy that you were able to get adequate care at one of the bigger chiropractic offices, but we’ve heard from more than one customer that many of them are charging far too much for their services. We’re also happy to hear that you’ve noticed how we treat our patients. We make sure to treat each patient as an individual. Sometimes we hear people complain about other chiropractors by saying “they diagnosed me before they even met me,” meaning that the chiropractor had a playbook of standard procedures that they seldom deviated from. At Flex Chiropractic, we make sure to listen to every patient so that we can come up with a very specific treatment plan. Sometimes back pain relief involves manual chiropractic treatments, and other times it’s a good idea to introduce ultrasound therapy. Every person is different, as is their injury/pain, so our doctors always make sure to treat everyone individually. Thanks for writing in, Ohani. We’re so pleased that you felt comfortable when you stepped into our office. 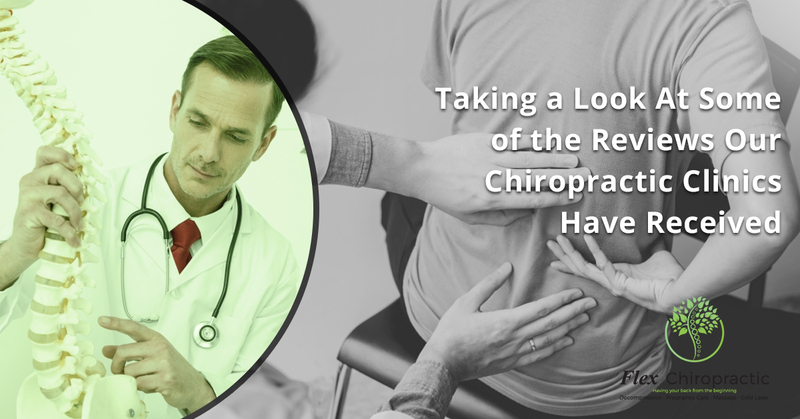 We understand that it’s not just the care our doctors give you, but also the way you’re treated by the entirety of the staff, that reflects on our chiropractic clinic. We also understand that everyone who walks in is at a different part of their treatment plan. Some people are coming in for wellness chiropractic visits. Other clients are walking in for the first time, having never seen a chiropractor before; they might even be skeptical. Treating everyone with respect and giving them the time they deserve is an important part of their treatment. If you go to our Lexington chiropractor, prepare to feel even more comfortable! You’ll be dealing with the same great staff, but we’ve moved to a newly renovated office at 305 Columbia Ave that’s closer to the center of Lexington. There’s a lot more space in our new clinic, so we’ll be able to offer even more services to a growing number of clients. But don’t worry, we’ll still keep the level of service that Hart was mentioning above. Okay, let’s take a look at one more review today. We’re glad to have had you in for treatments for so many years as well, Maribeth! You talk about how your lifestyle affects your back, and that’s true for most of us. We always try to give our patients advice on how their daily lives affects their bodies, and will offer advice on exercises to do to help the body recover when it’s not in our chiropractor’s office. But sometimes there are areas of your life — such as work — that are hard to change and lead to the need for more chiropractic. We’re always dedicated to helping people find the treatments they need when they’re here and making them fit into their daily lifestyle. If you’re looking for chiropractic care in Lexington or Columbia, we hope the reviews from our customers have convinced you that Flex Chiropractic is the best choice. Want to read more reviews? Click here to find out even more about us!